When it comes to interior design, there are few things that you can add to a room that have more impact than chandeliers. A chandelier adds a touch of class and luxury to a room and turns any living space into a vibrant, cozy place that you’ll love spending time in. It adds to the aesthetic quality of a room which adds some value to the entire property. 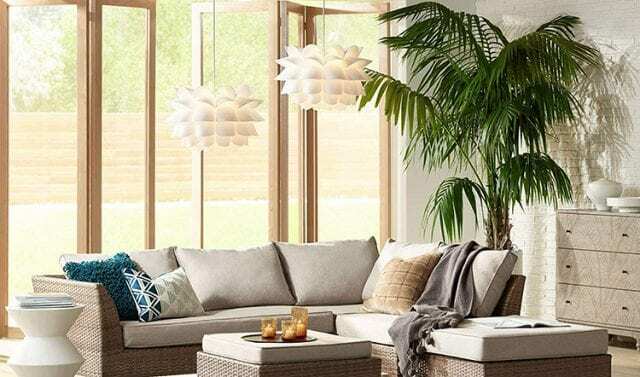 Even though chandeliers are available in many different types, one of the most popular types, especially for homeowners, is floral/flower chandeliers. The following are the top 10 flower chandeliers you can buy today. This is the perfect chandelier to get if you want to add fresh style to your room. 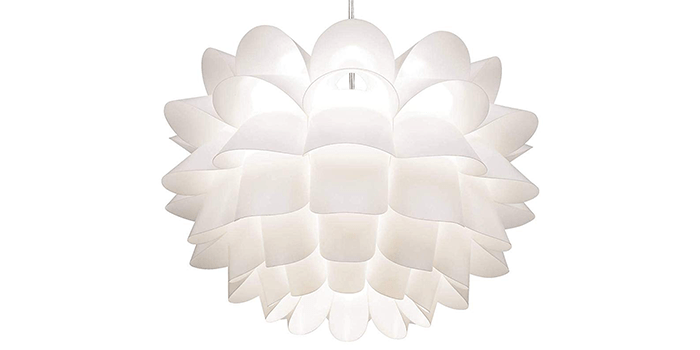 This many-petaled chandelier has a modern yet organic design featuring lightweight resin construction. It comes with two pendants each 19 1/2 inch wide and 12 inches high with bulbs whose light is diffused through specially positioned curved panels creating a beautiful look. Each pendant weighs 4.41 pounds and comes with a 10-foot electrical cord that’s cut to the desired hang height. It uses 60-watt base bulbs which you buy separately. 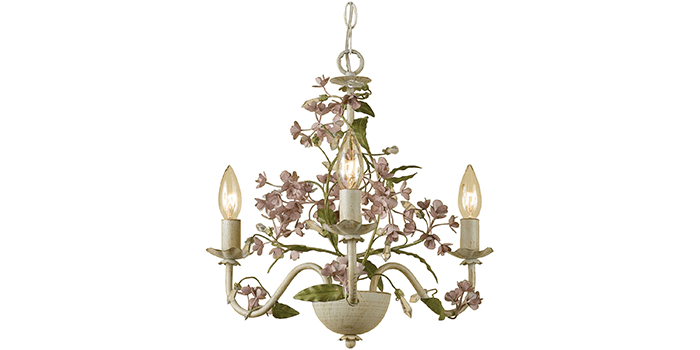 This chandelier features rose coloured cut metal that has an antique cream finish. The country-style chandelier is 15 inches high and 18 inches deep and uses 3 60-watt candle base bulbs that are bought separately. It comes with swag-kit and hard-wire options to cater to different needs. Since each Grace chandelier is handmade, you can be sure you are getting a uniquely crafted chandelier that no one else in the world has. This absolutely stunning chandelier has a 4-light design that is draped and decorated with beautiful crystals that capture and reflect light coming from the bulbs. The whole thing is held by a beautifully crafted wrought iron frame that is strong and adds to a finishing touch to a great fixture. The chandelier has a height of 15 inches and a width of 11 inches and weighs 6.7 pounds. It comes with 18 inches of chain and wire to hang it in your favorite room. It uses 4 40-watt candelabra bulbs which you have to buy separately. 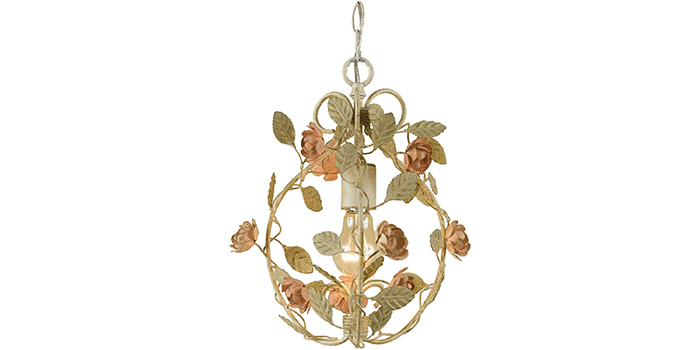 This is a flush mount chandelier that has a crystal pendant decorated with a pink rose flower chandelier. It uses 5 maximum 49-watt bulbs which are not included. The chandelier is made of metal that is painted silver to blend in with the decorative flower patterns. It measures 15 inches height, 19 inches width, 19 inches length, and weighs 5.5kg. The clear crystal decoration creates an ambient light that helps set a cozy mood in any room you install the chandelier. The best rooms to install the LightInTheBox Idyllic Modern chandelier is in the dining room, living room or bedroom. If you are looking for a smaller sized chandelier to install particularly in the bathroom, the AF Lighting Ramblin’ Rose Chandelier is a great choice. 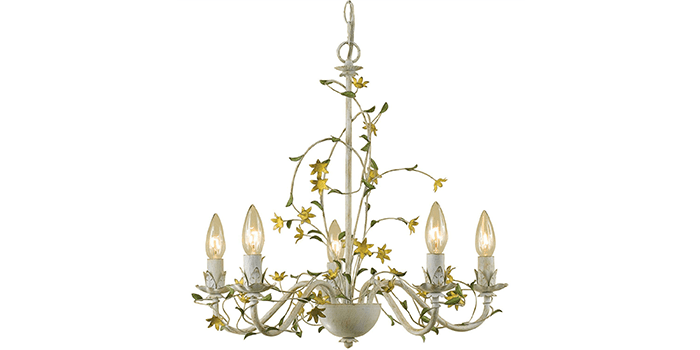 This country style chandelier’s design features green leaf accents and cut metal roses with antique cream finish. It uses one maximum 60-watt bulb which is not included and comes with swag kit and hard wire options. It has a height of 13 inches, depth of 10 inches, a width of 10 inches, and weighs just 5.9 pounds. 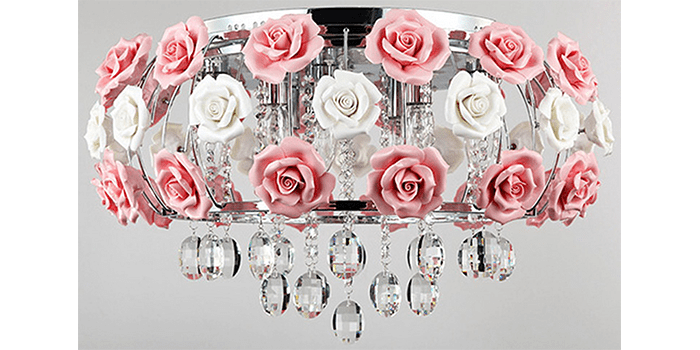 If you love roses, this is the perfect design for you and as a bonus, no two are alike as all AF Lighting Ramblin’ Rose Chandeliers are handcrafted. 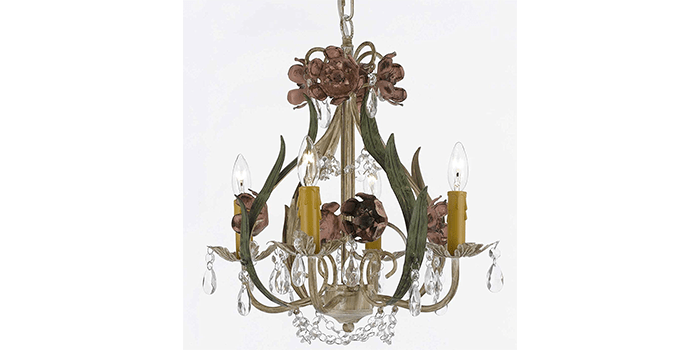 This chandelier comes with a beautiful metal leaves and flowers design in a spherical shape making it appear as a floating planet of glowing leaves. It has an antique gold and English bronze finish to add to its traditional glamor. It has a diameter of 16 inches and a height of 18.75 inches from the ceiling to the bottom of the chandelier. Also included are 120 inches of supply wire and 72 inches of hanging chain. It requires 4 60-watt bulbs which you buy separately. 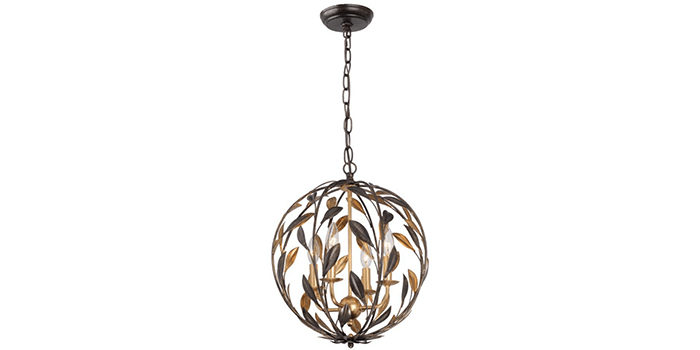 This chandelier is exactly what you need to add a fresh look to any room. 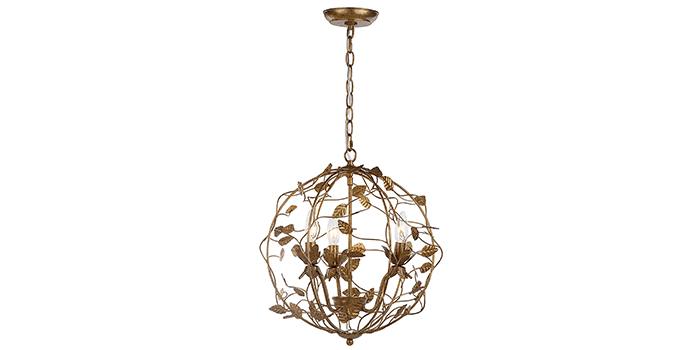 It is beautifully crafted using metal and glass and features a gold leaf finish which illuminates its dainty and graceful nature-inspired decorative details. It is perfect for bringing a charming botanical style to your living room, bathroom, library, den, family room, or study. It has a diameter of 17 inches and a height of 18 inches. It can be hanged to a maximum height of 92.75 inches making it suitable even for commercial spaces. This is the bigger version of the AF Lighting Grace 3-Light Chandelier and also features rose coloured cut metal with antique cream finish. The country-style chandelier is 21 inches high and 21 inches deep and uses five 60-watt candle base bulbs that are bought separately. It comes with swag-kit and hard-wire options to cater to different needs. Since each Star Flower chandelier is handmade, you can be sure you are getting a unique chandelier that looks exactly like no other. 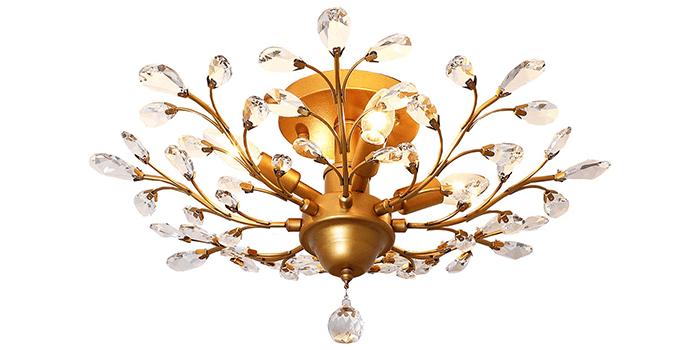 This is a four-light chandelier that is round in shape, made of metal with an antique gold finish. It has a beautiful flower-like design with petals sprouting from the center to create ambient lighting when in use. It has a width of 16 inches, a height of 6.25 inches and weighs 15 pounds. It requires four incandescent 60-watt bulbs and can be installed in the living room, bathroom, bedrooms, foyer, or dining room. This chandelier has a luxury design that features clear K9 crystals that are gorgeous and resemble a network of branches and flowers. It has a diameter of 23.6 inches and height of 11.8 inches when installed. It requires four 40-watt bulbs which can be incandescent, LED bulbs, halogen bulbs, energy saving bulbs, among other types of bulbs. It’s uniquely stunning design makes it great for your living room, kitchen, bedroom, dining room, foyer, hallway, office, and other areas you see fit to install it.